Last weekend, my favorite girlfriends came over for a “Mamma Mia” night. Really, this just meant lots of greek food and a little ABBA music. And talk about gas and constipation and the revelation that talking about gas and constipation is proof positive that we, indeed, are getting old. 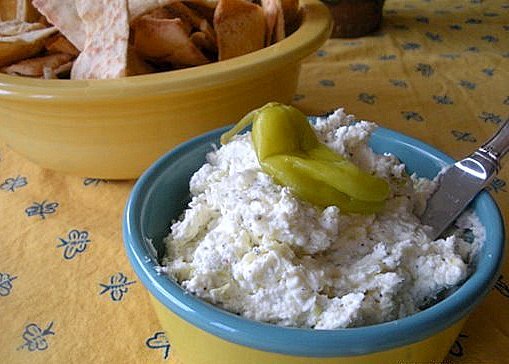 I also whipped up a yummy spread made of feta cheese and peppers, also known as Kopanisti. It’s terrific and salty and tangy with just a bite from the peppers. It’s excellent on radishes, cucumbers, pitas, and pita chips. Pita chips are from heaven. Stacy’s, thank you for making such pure deliciousness. Also, curse you, because I can’t stop eating them. 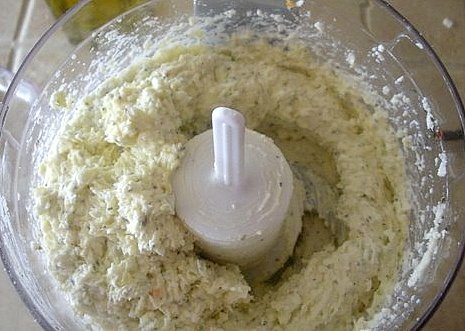 Add all ingredients to a food processor and blend well, adding more olive oil if needed to get the dip to a spreading consistency. Add more red pepper flakes or pepperoncini if you’d like a stronger pepper flavor. Chill for at least an hour to allow the flavors to meld. Serve with dippers such as pita chips, pita bread, cucumbers, and/or radishes. Your blog and recipes rock! The older I get, the more I turn toward vegetarian meals, especially during the hotter months. I’ve only tried a few of your recipes, but so far, so yummy! A few times, I’ve snuck some completely vegan meals past the hubs (not that he’d care that much…he’s not a militant carnivore or anything). I don’t tell him it’s vegan until after the compliments and “nummy” noises fade, which is fun. Thanks!